From Eugene - Springfield, drive scenic Highway 126 east toward the Hoodoo Ski Resort and discover seven charming riverfront communities tucked in along the McKenzie River. 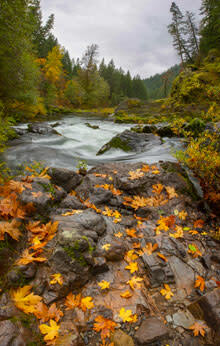 Molalla and Kalapuya Native Americans moved through the McKenzie River area as far back as 8,000 years ago. They were hunter-gathers, thriving on local berries, fruits, nuts, roots, fish and wildlife. Obsidian was used to create arrowheads and spear tips. By 1835, most of the population had succumbed to disease epidemics introduced by Europeans. Some former camps have been identified by earth ovens, peeled tree bark and rock quarries, but little else remains. The famous McKenzie River is named for Scottish explorer Donald Mackenzie, nicknamed "Perpetual Motion," who enthusiastically traversed this watershed in the early 1800s. 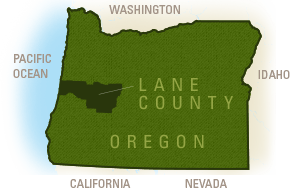 The Oregon Trail brought settlers to the region starting in 1843. The earliest recorded homestead was by James Belknap in 1861 on a McKenzie River site that supported a ferry service and eventually the historic Belknap Covered Bridge. A wagon route was established from Walterville to the upper McKenzie River, and stage stops every six to ten miles apart reflect the current river communities today. Gold was found, but lumber and livestock later became the primary industries. In the 1870s the McKenzie River&apos;s hot springs and fishing lodges started to draw tourists, and this increased when the road was paved in the 1900s. Cruising the scenic routes became a popular pastime, and in the 1930s the Civilian conservation Corps built the Dee Wright Observatory along a former 1860 wagon route over the lava beds (Hwy 242). The drift boat is the centerpiece of recreation for the riverfront Cascades communities. 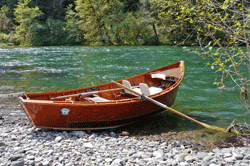 In the 1920s Prince Helfrich and Leroy Pruitt crafted the famous McKenzie River Drift Boat. They refined an open-water dory for improved maneuvering in river rapids, launching a design that is still used today. The McKenzie River Drift Boat is recognizable by its wide, flat bottom, flared sides, flat bow and pointed stern. The rower faces downstream. An example of the boat is displayed in the Eugene, Cascades & Coast Adventure Center in Springfield. Another excellent source of information on the McKenzie River Drift Boat is Roger Fletcher&apos;s Drift Boats & River Dories: Their History, Design, Construction and Use. For that authentic Northwest boating experience, several river guides offer fishing excursions using the McKenzie River Drift Boat. Didn&apos;t Bring Your Life Jacket? Oregon law requires each person in a boat to have a life jacket. 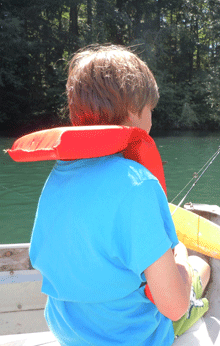 All children 12 and younger must wear their life jacket in the boat. Experienced river folks know life jackets save lives -- but don&apos;t work unless you wear them -- and that applies to good swimmers, non-swimmers, expert river guides and first time rafters alike. The McKenzie Fire and Rescue and the McKenzie River Guides Association coordinate a free Life Jacket Lending Program. Nine locations along the McKenzie River loan out life jackets in a variety of sizes to all who need them. For participating locations and more information call 541.746.6312.